The yellow, orange and white trianglular candy that’s eaten at Halloween is an American classic. George Renninger, a Wunderlee Candy Company employee around 1880, invented candy corn in Philadelphia. It was produced for widespread consumption in the 20th Century by Jelly Belly, which was then known as the Goelitz Confectionery Company. Goelitz was a candy company founded by two brothers in 1869 in Belleville, Illinois. It fell on hard times in the 1890s and was sold. But the children of Gustav Goelitz decided in 1898 to restart the family business. One of the products which they produced was candy corn. Originally made by hand, manufacturers would combine sugar, corn syrup, wax and water into a mixture in massive pots that they would cook. They would then add fondant and marshmallows before pouring it into smaller buckets. From the buckets, the concoction was transferred into a mold. The process would be repeated for each colored section to layer the candy with its tri-color appearance. First white, then orange, and finally yellow. The finished item was packed into crates and barrels which were transported by wagon. Production was limited because of limited machinery, and candy corn was only available to purchase from March until November. Candy corn was the companies best seller. The company split in 1922, but difficulties with shipping candy long distances allowed them both to flourish. In the 1920s, candy corn sold for 16 cents a pound. The Depression brought difficulties for the candy business, as the going price for candy corn fell to 8 cents a pound. But they both survived. Candy consumption rose during World War II as chocolate was rationed and America ate non-chocolate candy like candy corn. It wasn’t until the 1970s that other manufacturers began producing candy corn, and the Goelitz companies struggled until Herman Goelitz Candy began making jelly belly, a version of jelly beans, in 1976. 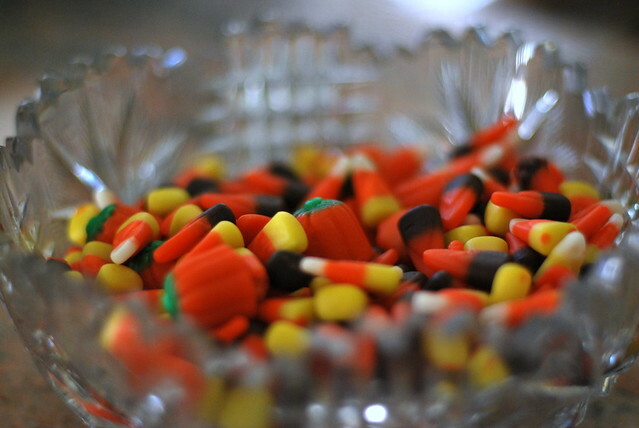 The leading manufacturer of candy corn today is Brach’s Confections, which is owned by Farley’s & Sathers. The ingredients are slightly different (it uses honey), and it is made with machines, but the process is pretty much the same. The shape is created by cornstarch added to a tray of molds. The holes are filled by white syrup, then orange syrup, and finally yellow syrup. The mold cools and the candy takes 24 hours to harden before it is emptied from the trays. Excess cornstarch is sifted and a glaze added to create the shine. And, after packaging, it’s ready. Altogether, 35 million pounds of candy corn will be made this year. 75% of it is sold around Halloween. There’s also different colored candy corn available at Christmas, Valentine’s Day and Easter. But Halloween will probably always be the leading time of year for this candy.